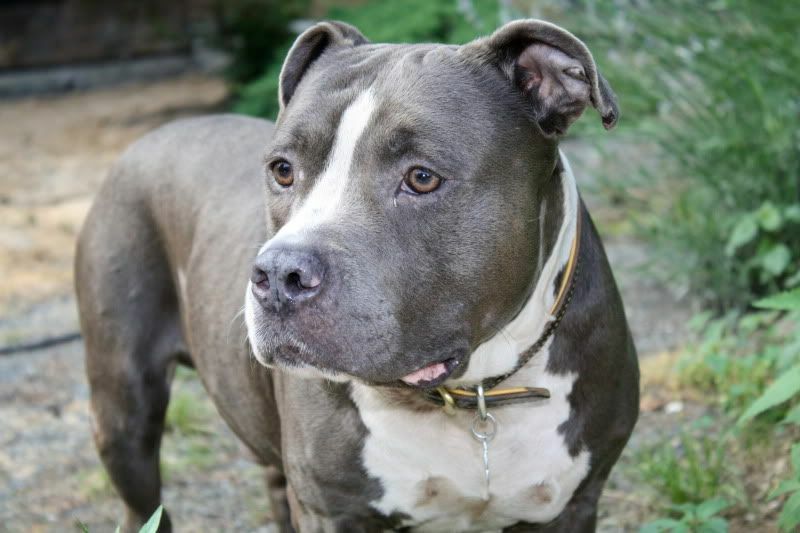 Rocky is a 4 to 5 year old American Bully. 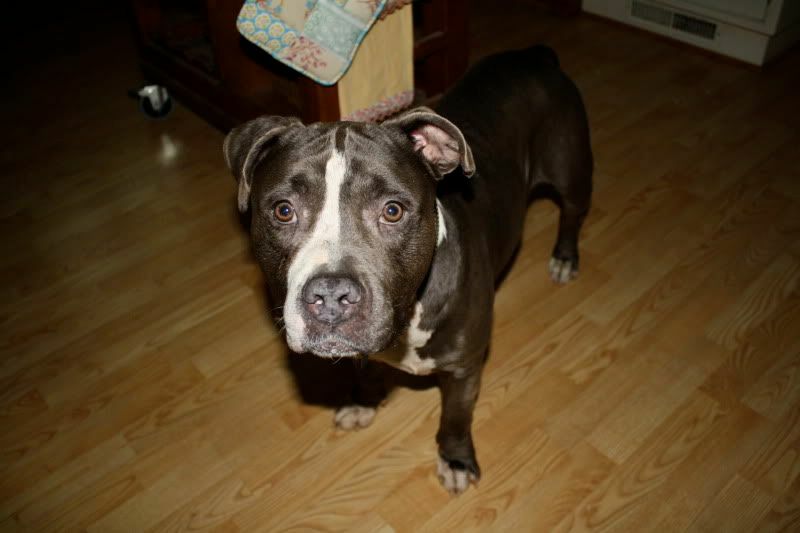 He is neutered, up to date on shots, house trained and learning basic obedience commands. He is an absolutely wonderful dog. He is amazing with other dogs and doesn't show an ounce of dominance. He has yet to meet a dog he didn't interact with beautifully. He completely ignores the cats and has been wonderful with children. This boy didn't even blink an eye at the fourth of july fireworks, and has greeted everyone he's met with a big bully smile. 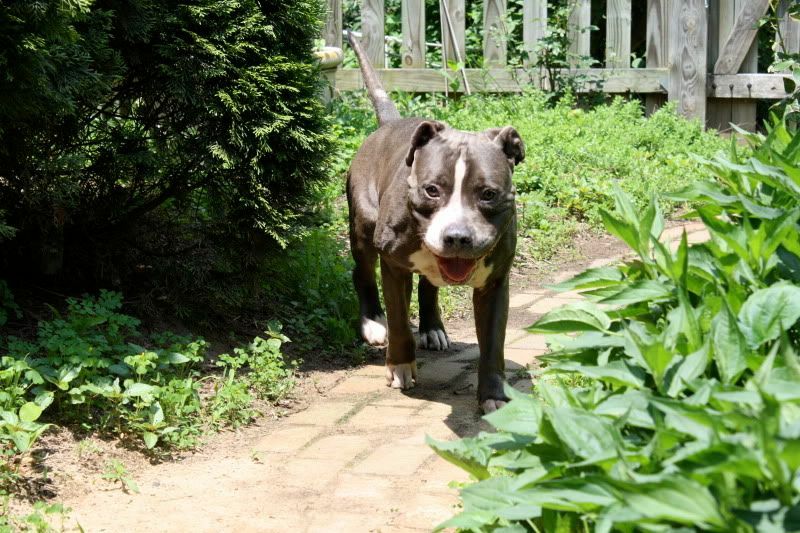 Rocky has had a rough life and deserves a life long, loving home. He seems absolutely perfect and he is one beautiful dog. I hope he gets his forever home soon! For anyone who may be interested, he is currently located in Baltimore but we can travel! If anyone south east is looking for some bully lovin, I'll be traveling their frequently from August to January. O god! He is TOOO Cute! I Love Blues!!!! And he is just stunning! I wish I werent traveling for work so much right now. 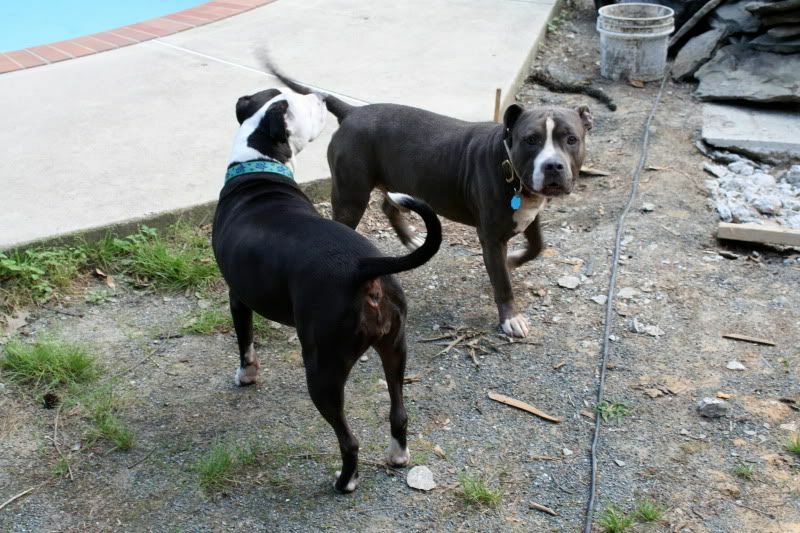 I am looking to adopt another pit within the next year. i really wanted a female because i have a male and thought they might get along better. sounds like rocky and my male would probably get along just fine. Rocky has a couple potential adopters! Wish him luck for our interviews on this weekend! Fingers crossed someone falls for this dog has hard as I have-though I don't think that'll be to difficult. 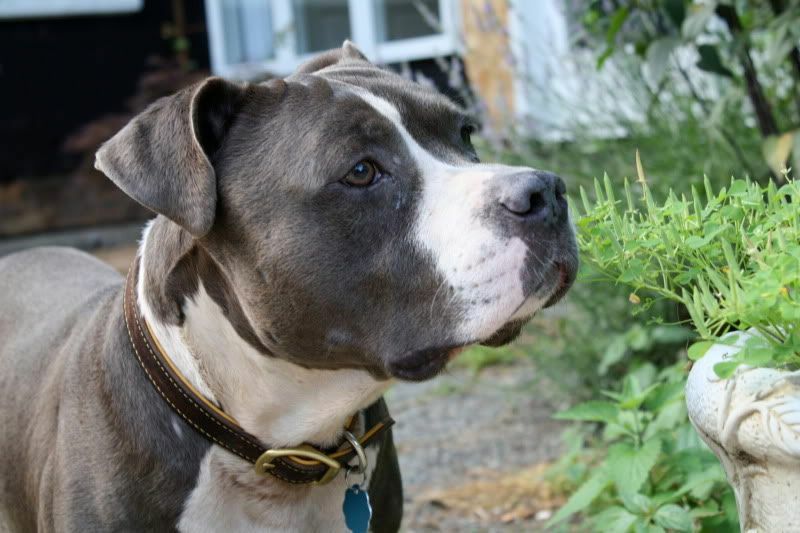 Rocky has yet to meet somebody who wasn't smitten in a few minutes. Mireille, I would consider driving North if interviews fall short around here and for the right home of course. For now I am thinking Rocky would do better in an only dog home. Rocky had a great interview today with a wonderful couple. They've had Pit Bulls in the past and are extremely doting owners. I'm going to do a homecheck on Monday and if everything looks good he's going to stay for a few days. If all goes well we're signing the papers and Rocky is going to finally get the permanent family he deserves. I don't know if you are allowed to give updates, but since I don't have any pictures to post in the gallery I thought I'd give a bit of an update on Rocky. He's been in his new home I guess 5 months now and is thriving. His owners are still head over heels for him. They discovered he had a old broken hip (most likely from being beaten) that heeled on its own. He is on pain medication as needed and they are working hard to keep him in good shape. I'm glad to hear that, as they seemed the type to think the fatter the better! I'll hopefully be paying him a visit soon. Such a great family and they are so eager and happy to hear from me and tell me about their boy. So happy for this dog. My friends and I miss him everyday. I wish so badly I could have kept him, but I know he is getting the individual attention and love that he soaks up like a sponge. A long way to come from being beaten outside of a bar to curling up on a couch with a doting family.